"Pitons are metal spikes used by climbers and rescue workers. 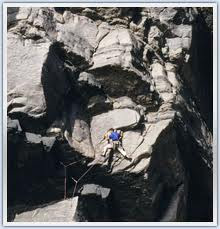 They are driven into cracks into rocks or ice to provide secure holds for climbing equipment. Using pitons is crucial for safety." My pastor used pitons as an illustration in his sermon a few weeks ago as he talked about God's glory in "A Request for Glory Part 2" here. As my husband and I were talking about the value of pitons in our spiritual walk, we discussed how we NEED to recount the deeds of the Lord. (Psalm 9:1) We are needy for placing pitons on the rock face as we climb. How quickly I fall. How easily I slip. How fast I could sink back to the bottom of the mountain, but the pitons are safely placed in the rock face, holding me steady to continue my climb. When I slip, I fall no further than the piton that is holding me. So, onward I climb. If a mountain climber came to the mountain, stuck in his first piton, and chilled because he "climbed the mountain", his ascension would never move forward. This mountain climber, while dressed and ready, has not truly climbed the mountain. For many years, I did just that. I stuck my piton in the mountain of God, and announced that I had "climbed the mountain". A few years later, I moved the piton a little to the right, since I was unsure of it's placement. I would inch upward, but only in slow ascent, because I thought that I had arrived. I had "climbed" this mountain. I was only looking down, not up. I wasn't looking to the mountain, to God. I am sad that the placement of my first piton was not accompanied by upward movement. I am sad that it took years to cover the ground upward. I'm sad that I made such a slow start. For if I climbed all my life, I wouldn't reach the heights of this mountain. I wouldn't conquer the surface of our God! He is too big, too rich, too deep to comprehend. But He is so good. The ascent is so worth it! I thought that coming to a point of salvation was THE essential piece that allowed me to ascend to the top of the mountain. While I DO NOT want to down-play salvation, I want to recognize that it should be a piton in our ascension. It's the first piton, holding us fast to the mountain. But, in recent years, many more pitons have been nailed into the rock face! I pray that many more will come. When I was five, I saw a glimpse of righteousness in my family, all who were walking in God's righteousness. I was overwhelmed with the sense of "missing it". I talked with my family, and came to a point where I wanted to follow in their footsteps. Piton. I was sitting in a marriage Bible Study with my love and couldn't shake the thought... "I can't muster this. I can't make myself good. I can't take hold of this on my own." The things that I had been making checklists for (i.e. love, hope, joy, peace, patience, kindness, goodness, faithfulness, gentleness, self-control) were things that I had tried to muster. Fruits of the spirit cannot be mustered, I assure you. You can get close, you can try really hard, and you can look pretty good, but I assure you that it is impossible to muster this! Piton. I can't do this alone. I NEED others to see me. I realize that through my depravities, through the exposing of sin (and killing of sin), I am able to see God's mercy. I am able to taste grace. I am able to understand how I can be a part of a people, being real. (See old blog post from May 2008 here.) Piton. I began reading the Law. I began finding places where I was labeled as guilty. I began to understand how my poor attempts at goodness got me as far as the end of the law. I am guilty. I am stained. I am doomed to accept the wrath of God. BUT GOD demonstrates His love through Christ! I have enjoyed this sweet, savory, rich scandal! I am wearing the righteousness of another. The very thing I can't muster IS the very thing He has given me to cover my nakedness. His righteousness covers me. Piton. I am created for His glory. I am created to glorify Him. Every breath should be to glorify God. I glorify Him by enjoying Him. I know Him and I enjoy Him. God be glorified through me. Piton. Thank you, God, for loving me and creating me. Thank you for sending Christ to die in my place. Thank you for giving me righteousness that is undeserved and perfect. Thank you for covering the nakedness of my sin. Thank you for drawing my eyes to you. Thank you for placing many in my life who walk so closely and openly with me. Who point me to you. God thank you for the scandal of the gospel. Thank you for the rich Word that you gave us to enjoy you. Thank you for a family that pours out grace towards me. I pray that you would make us more like you daily. I am absolutely blown away by you. I'm blown away by Your holiness, love, mercy, and grace. Continue to draw me to you! I want to lay hold of that which is taking hold of me! God, I love you.